The Old Brewery was a five-story building, old and dilapidated. Along one wall an alley led to a single large room in which more than seventy-five men and women of assorted nationalities and races lived together. This was the Den Of Thieves. The name was appropriate. Along the other wall ran another filthy lane called Murderer's Alley worse than the first. Upstairs there were about 75 other chambers, housing more than 1,000 people...men, women and children. The section was a warren, with underground passages and murderous cul-de-sacs, into which the police dared venture only in large numbers, for the Old Brewery for a period of more than fifteen years averaged a murder a night. 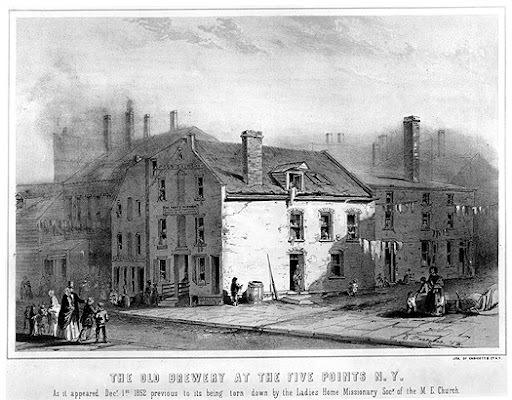 The Old Brewery was razed in 1852 and replaced by the Five Points Mission in 1853. The Mission's original purpose was to stamp out the rampant sin of the district by converting errant Catholics to faithful Methodists. The resident minister, Lewis Pease, quickly found that such a line did not work in the Five Points, and instead focused on providing much needed aid to the poverty stricken residents. He set up a sewing shop and provided women with jobs—requiring that they attend a religious service of their choice on Sundays. Finding that women had trouble maintaining steady employment due to child-rearing duties and unstable homes, he asked the Mission board to open a school and began renting apartments to women at a subsidized rate. In many ways, it was one of the first social welfare programs in the nation. However, Mission board leaders would not support or fund Pease's actions, so he left and founded the House of Industry, located across the street from the Mission. It served the community, and city, for 60 years before moving to a new location. Left: The Old Brewery, 1852 Charles Parsons. | Right: Five Points Mission, 1853. 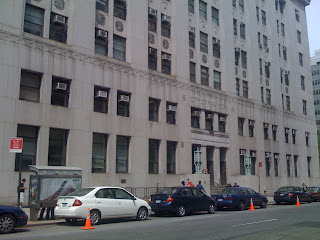 Above: The site of the Old Brewery/Mission is now home to court buildings. Daniel Patrick Moynihan Courthouse is shown on the left. Fed up with segregated services, black worshipers founded St. Philips. 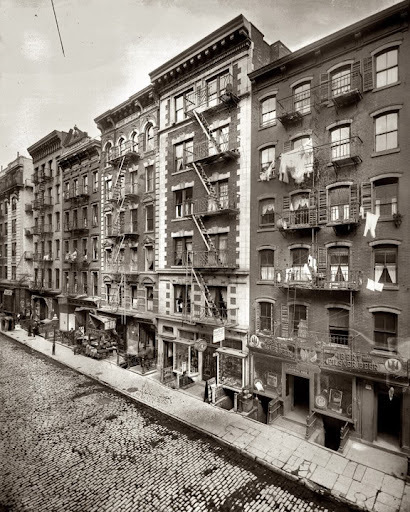 In the 1800s, it was located at 31 Centre Street between Worth and Leonard, and it grew into one of the largest black congregations in New York. 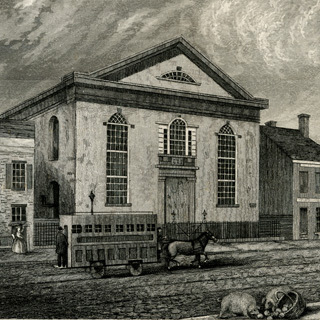 The church was targeted in the riots of 1834, which were spurred in part by the actions of Arthur Tappan, who invited Rev. Samuel Cornish, an African American, to sit in his pew at the Laight Street Church. Some parishioners were ouraged, and rumors began circulating that the abolitionists were promoting interracial marriage. During the summer of 1834, there were several incidences in which a mob attacked and destroyed the property of abolitionists and African Americans, including churches. St. Philips African Episcopal Church survived the incident however, and moved uptown in 1886 and then to its present home on 134th Street in 1910. Left: St. Philip’s Episcopal Church, early 1800s. John F.E. Prud’homme engraving. Image © Collection of the New-York Historical Society/Bridgeman Art Library. 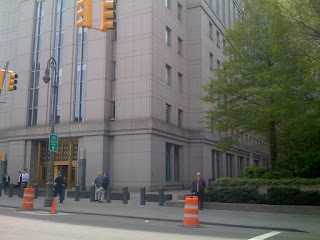 | Right: A court building now stands on the site. We'll be talking a bit more about life in the tenements in a subsequent post, but no Five Points tour would be complete without a mention of these disreputable residences. 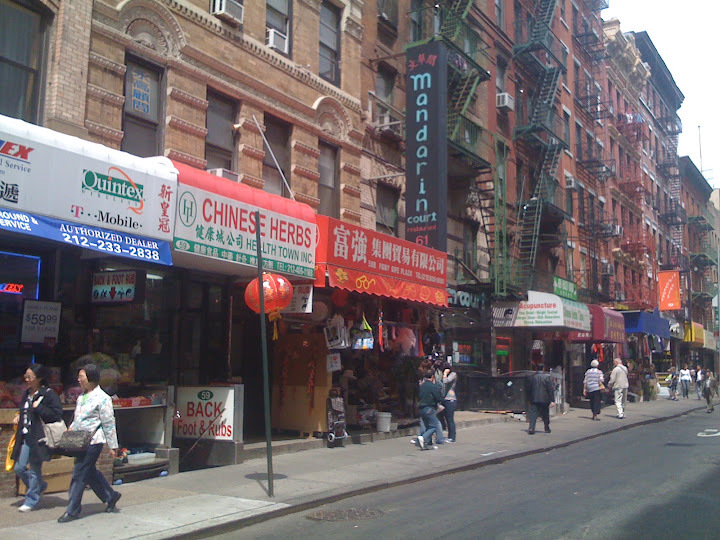 While the Five Points was home to several infamous tenements, 65 Mott Street has the distinct honor of being the first building constructed specifically to serve as tenement housing (Anbinder 2001: 81). Constructed in 1824, at seven stories, it was an anomaly amongst its two story wooden neighbors. Anbinder estimates that 32 to 36 two-room apartments were crowded into the 2450 square foot building. Tenements were certainly dark, crowded, and dirty in most cases. Landlords tended to avoid maintaining the buildings, and the tenants often took in boarders to help offset the rent. But there are also stories of folks who avoided the overcrowding, and had fairly comfortable apartments in the Five Points, though naturally they didn't receive quite the same attention. 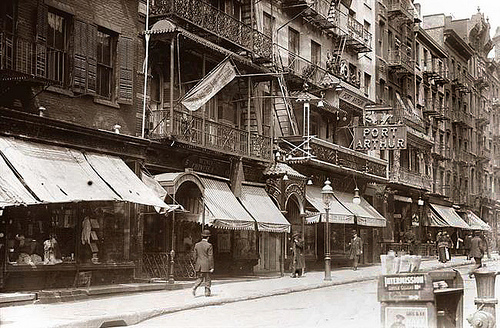 Left and Right: Views of Mott Street, early 1900s. 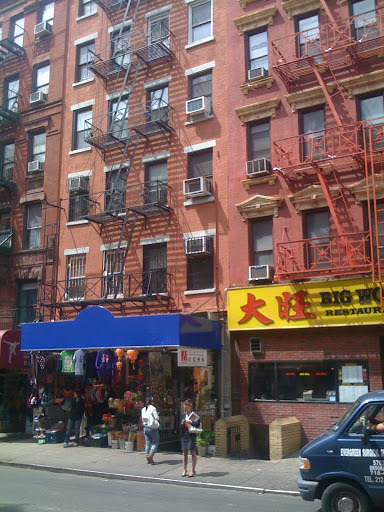 Left: 65 Mott Street, the first NYC tenement. It's the building on the left with the blue awning. 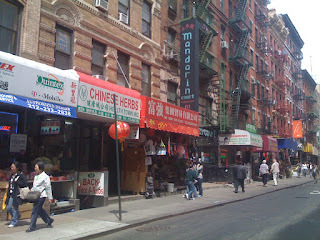 | Right: A view of Mott Street, April 2010. 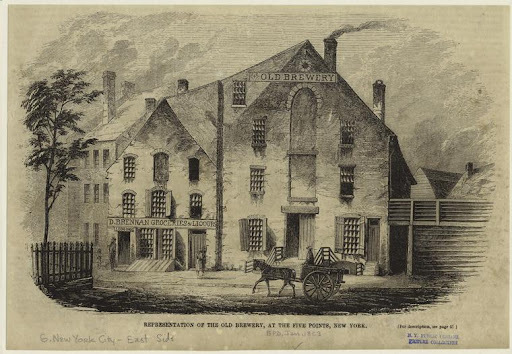 In 1838, New York City built a prison over an area where the Collect once bubbled. 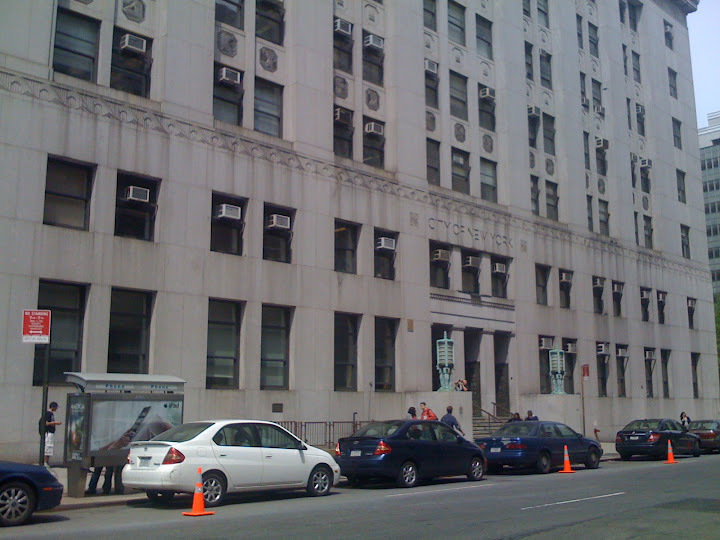 The building's formal title was The New York Halls of Justice and House of Detention, as it also housed the city's courts, police, and detention facilities. However, because it was built on the ground of the former Collect, it soon ran into similar problems experienced by the rest of the neighborhood—it began to sink. 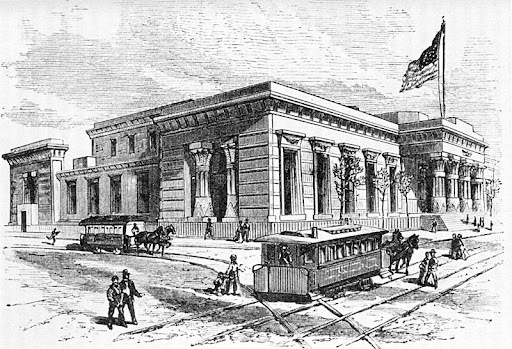 It was also rife with corruption, and by the 1850s New Yorkers were calling for it to be closed. It was moved in 1902 and 1941, before being partly closed in 1974. However the nickname persists at the jail at 125 White Street. Left: The Tombs, 1870. | Right: Site of Collect Pond Park, present day. Former home of the original Tombs building. 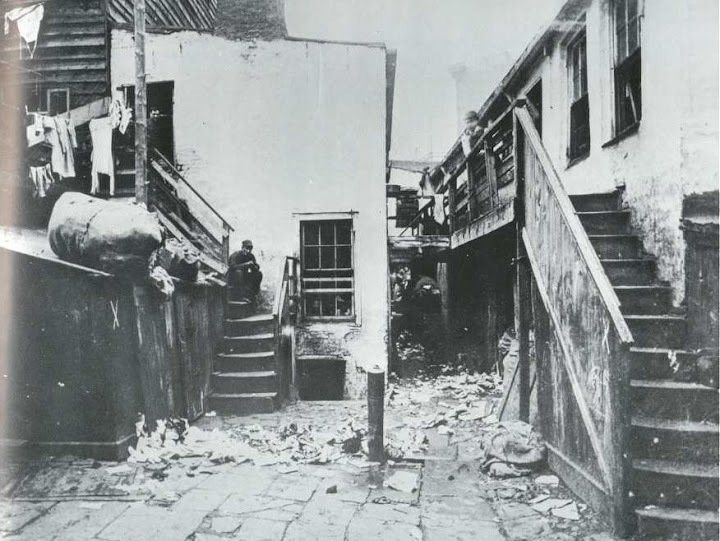 The immense crowding of the district often gave rise to cramped and dark alleys. 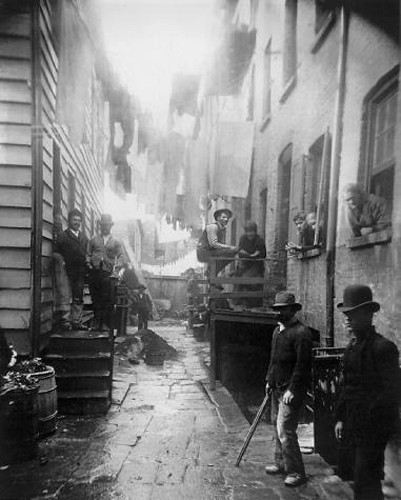 Two such instances are shown below in connection to another famous slum, Mulberry Bend. These dark passageways often came with their own reputations for danger. 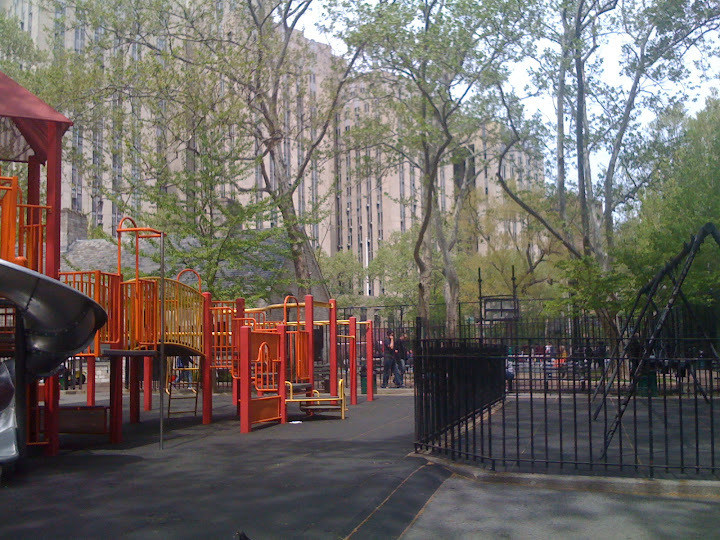 Today, the site is home to Columbus Park. Left: Bottle Alley. Jacob Riis. Right: Bandit's Roost, 1890s. Jacob Riis. 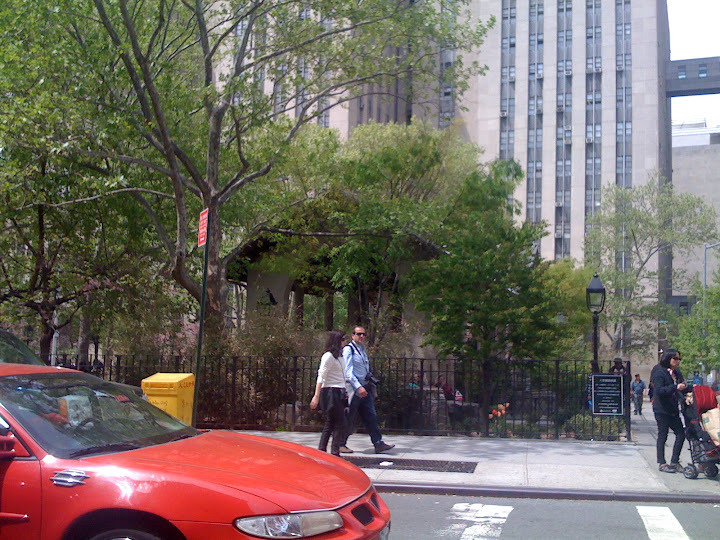 Left: Columbus Park. Right: Interior of Columbus Park, likely spot for an alley. Mulberry Bend was known within the Five Points for the numerous tenements that lined the street. It led right into the heart of the Five Points, and for many well-to-do New Yorkers it represented a path you avoided at all costs. Left: Mulberry Bend/Lane, 1890s. Jacob Riis. Right: Mulberry Bend, April 2010. Of the original three streets that formed the infamous five corners, only two really remain: Worth (Anthony) and Baxter (Orange). 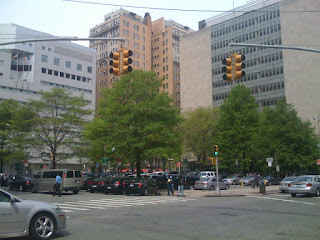 The third, Cross Street, underwent several changes, and now only a small portion of it lingers. 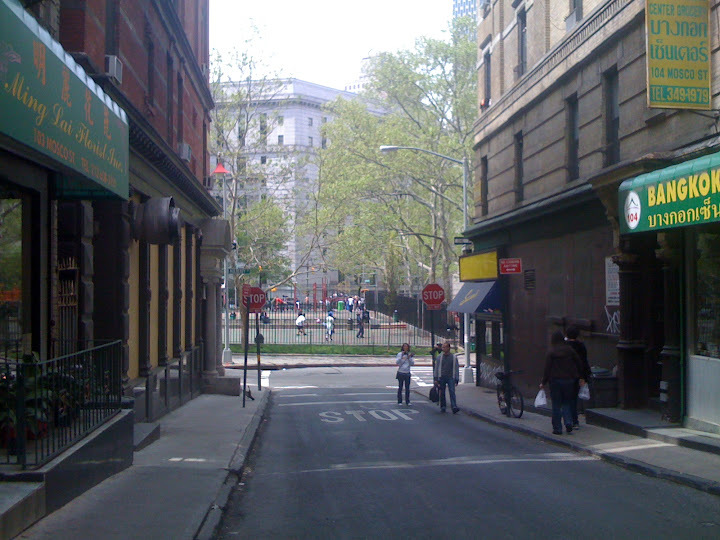 It was renamed Park Street in the 1850s, and eventually reduced to a lone single block, called Mosco Street. 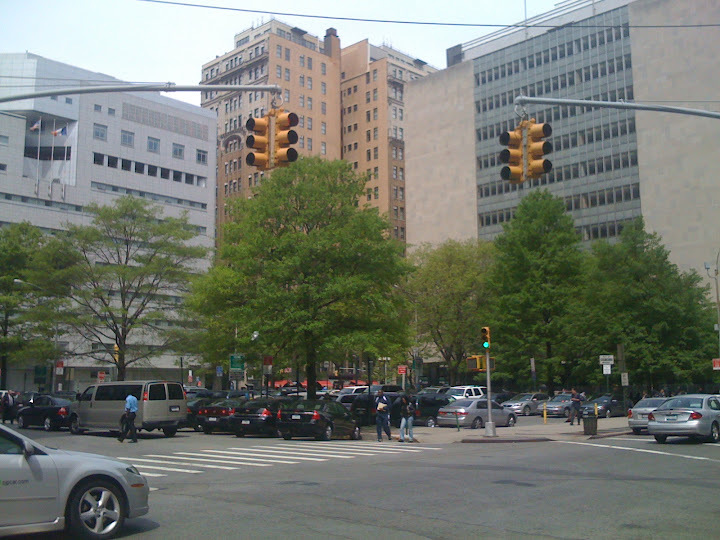 Standing on the corner of Mott and Mosco, you can look down at what would have been the Five Points, noting that the land there is lower than the surrounding area (a legacy of the Collect Pond), and recall a time when you perhaps would not have dared to venture down this small street. Left: Map from Tyler Anbinder's Five Points showing Cross Street. Mapmaker Chris Robinson. | Right: all that remains of Cross Street is this small alley-like road which still points in the direction of the original five corners. What's next? We'll look at the Collect Pond's role in the formation of the Five Points, and investigate tenement life. Stay tuned. Anbinder, Tyler. (2001) Five Points. New York: Penguin Group.